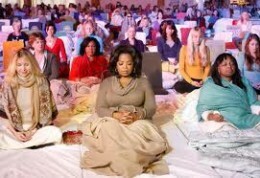 Now my little town of Fairfield, Iowa, has once more been put on the map – this summer Oprah Winfrey came to meditate with MUM’s yogic flyers in the Golden Dome for women. Why in the world would Oprah Winfrey come to Fairfield, Iowa, a tiny Midwestern town in the middle of cornfields, which boasts approximately 9,464 people? Oprah can be anywhere at any time doing anything she pleases, her time is money, and her schedule grueling. In Fairfield, there is no spectacular scenery, no ocean front properties, no mountain views, or sandy beaches, and no redwood forests. Okay, we have a cute town square, and she did show up at my favorite coffee shop on the square and chatted up the locals—the coffee is spectacular but not enough of a draw for Oprah. But, you know Oprah, she is not one to put on airs. And, there is Maharishi University of Management (MUM), formerly Maharishi International University, founded in 1973, by the late world-famous, Maharishi Mahesh Yogi. There is the largest population of TM meditators in the world. And, there are the Golden Domes of Pure Knowledge (yes, these are literally golden dome-shaped structures) where advanced TM meditators can come together to FLY (up for debate) and meditate in a group for world peace and personal enlightenment. Do you mediate? I do.